We are regarded as one of the leading brand in offering highly efficient Dough Ball Making Machine. 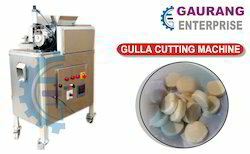 Machine provided by us is commonly demanded in food processing industry and is suitable for making dough balls in bulk. The machine is designed from the scratch and carefully manufactured with the use of well tested components and cutting edge technology. Being a quality driven company. we assure our clients that this machine is excellent on counts of functioning, quality & durability. All Pieces Are Of Perfect Size, Shape Weight. Castor Mounted For Easy Movement. Complete Top To Bottom S.S.202 Covering. Easy To Operate, Even Unskilled Worker Can Operate.Energy Efficient Machine. Huge Labour Power Saving Benefits.Hygenic Operation. Easy To Operate, Even Unskilled Worker Can Operate. Looking for Dough Ball Making Machine ?